Chelsea Ladies defender Hannah Blundell has hailed the impact of the Women's Super League champions' winter signings after their 100% winning start to 2016. Manager Emma Hayes added forwards Karen Carney and Beth England, midfielder Jade Bailey and goalkeeper Rebecca Spencer to her squad during pre-season. Carney already has two goals and three assists, while England has netted once, in three competitive Blues appearances. "It feels like they have all been here for ages," Blundell told BBC Sport. "On and off the field, they have settled in brilliantly. You would not know they have only just joined us. We are really lucky with how close we are as a group." 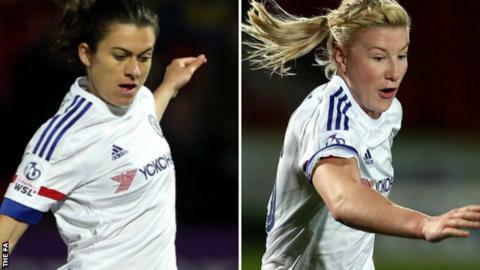 Chelsea began the defence of their league title with a 4-1 win at newly-promoted Doncaster Rovers Belles. In their bid to defend the Women's FA Cup, Hayes' side have reached the semi-finals thanks to comfortable wins over Aston Villa and Doncaster. "It's great to play with such an experienced England player like Karen Carney," Blundell added. "Hopefully we can all go on to have more success together. "Obviously our main aim is to retain both titles and let's see what we can do." Chelsea are second in WSL 1, three points behind leaders Manchester City, who have played one game more.